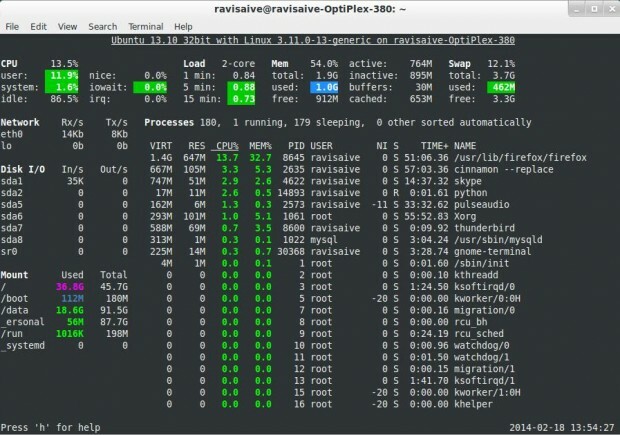 Earlier, we’ve written about many Linux System Monitor Tools that can be used to monitor performance of Linux systems, but we think that, most users prefer the default one that comes with every Linux distributions (top command). 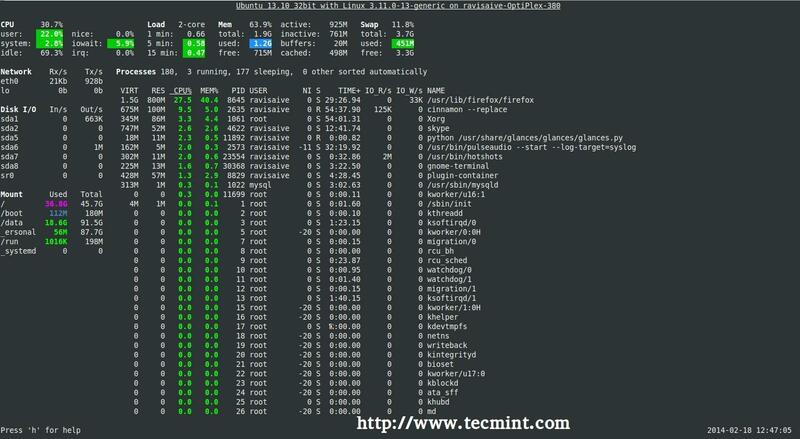 The top command is real time task manager in Linux and the most frequently used system monitoring tool in GNU/Linux distributions to find the performance related bottlenecks in system which help us to take corrective actions. It has a nice minimalist interface, comes with few amount of reasonable options that enables us to get a better idea about overall system performance quickly. However, sometimes its very tricky to find an application/process that consuming lots of system resources is a bit difficult under top. Because top command doesn’t have a ability to highlights programs that are eating too much of CPU, RAM, other resources. For keeping such approach, here we are bringing a powerful system monitor program called “Glances” that automatically highlights programs that are utilizing highest system resources and providing maximum of information about Linux/Unix server. 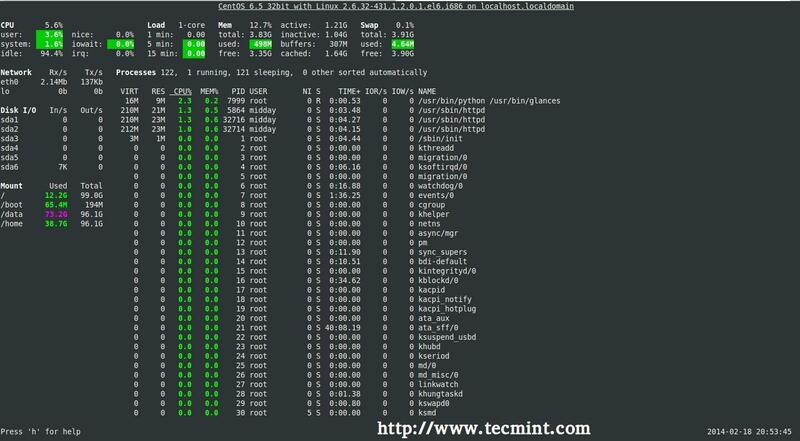 Glances is a cross-platform command-line curses-based system monitoring tool written in Python language which use the psutil library to grab informations from the system. With Glance, we can monitor CPU, Load Average, Memory, Network Interfaces, Disk I/O, Processes and File System spaces utilization. Glances is a free tool and licensed under GPL to monitory GNU/Linux and FreeBSD operating systems. There are lots of interesting options available in Glances as well. One of the main features we have seen in Glances is that we can set thresholds (careful, warning and critical) in configuration file and informations will be shown in colors which indicates the bottleneck in the system. CPU Informations (user related applications, system core programs and idle programs. Total memory Information including RAM, Swap, Free memory etc. The average CPU load for the past 1min, 5mins and 15 mins. Network Download/Upload rates of network connections. Total number of processes, active ones, sleeping processes etc. Currently mounted devices disk usages. Top processes with their CPU/Memory usages, Names and location of application. Shows the current date and time at bottom. Highlights processes in Red that consumes highest system resources. Here is an example screen grab of Glances. Although it’s a very young utility, you can install “Glances” in Red Hat based systems by turning on EPEL repository and then run the following command on the terminal. To start, issue the basic syntax on the terminal. Press ‘q‘ or (‘ESC‘ or ‘Ctrl&C‘ also works) to quit from Glances terminal. 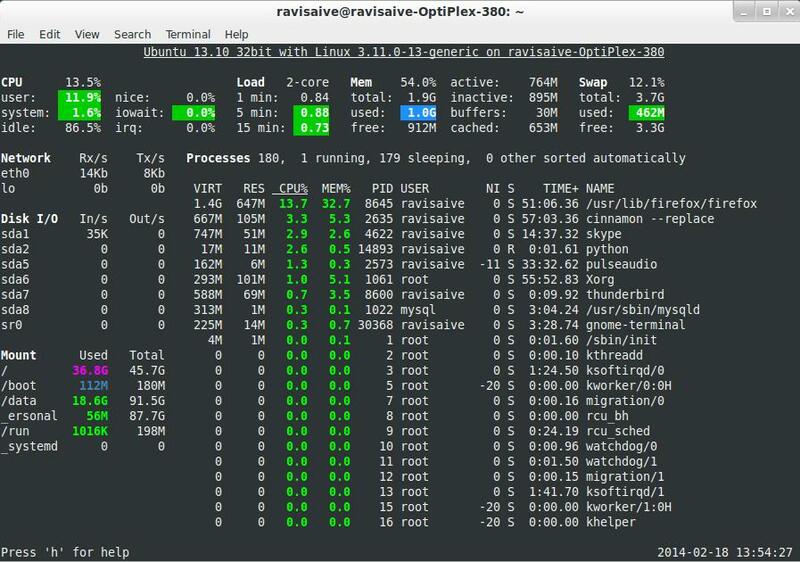 Here, is the another screen grab taken from the CentOS 6.5 system. By default, interval time is set to ‘1‘ second. But you can define the custom interval time while running glances from the terminal. We can set thresholds in configuration file. By default thresholds set is (careful=50, warning=70 and critical=90), we can customized as per our needs. The default configuration file is located at ‘/etc/glances/glances.conf’. Besides, several command line options, glances provides many more hot keys to find output information while glances is running. Below are the list of several hot keys. With the Glances, you can even monitor remote systems too. To use ‘glances‘ on remote systems, run the ‘glances -s‘ (-s enables server/client mode) command on the server. Note : Once, you issue ‘glances‘ command, it will prompt you to define the password for the Glances server. Define the password and hit enter, you see glances running on port 61209. Now, go to the remote host and execute the following command to connect to a Glances server by specifying IP address or hostname as shown below. Here ‘172.16.27.56‘ is my glances server IP Address. Below are few notable points that user must know while using glances in server/client mode. Glances is a much resources friendly tool for most users. But if you’re a system administrator who’d like to quickly get overall “idea” about systems by just glancing at command line, then this tool will be must have tool for system administrators. why not use top ? No doubt that top command is all time best monitoring tool for Linux, but glances provides some fancy look with some more features..that’s it nothing extra..